Hey everyone! I have a very special post to share with you today! To celebrate the upcoming Chinese New Year, I have joined 15 other amazing bloggers to throw a Chinese New Year Cookie Party! The Chinese New Year, is China’s most important and celebrated holiday. It’s marked by the lunisolar Chinese calendar, so the date changes from year-to-year. This year it falls on Monday, February 8th. Traditions may vary greatly across different parts of China, but essentially it’s a time marked by auspicious customs and a time to honor ancestors. It’s also a time filled with family and lots of wonderful food. Please check out these incredible cookie creations and have a very Happy New Year! The party continues on social media! We’re on Instagram, Facebook, Twitter! Just use the hashtag #ChineseNewYearCookieParty and show us your cookie creations! Celebrate Chinese New Year with these delicious Honey Almond Cookies! Softer and lighter than traditional ones, but every bit as delicious! In the bowl of a standing mixer fitted with a paddle attachment (or a standard large bowl if you don't a standing mixer), combine the flour, sugar, baking soda, and salt. On low speed, gradually add the pieces of butter. Once incorporated, add the eggs, honey, and almond extract. Beat until a smooth dough forms. Line a baking sheet with parchment paper. Roll a tablespoon of dough between the palm of your hands and place on the baking sheet, about 2 inches apart. With the palm of your hand, gently flatten the ball of dough and place a single almond on top of each cookie. In a small bowl combine the egg white with 1 tablespoon of water. Brush the cookies with the egg wash and bake for 15 -18 minutes. Allow to cool on the baking sheet for a few minutes before transferring to a cooling rack. (Refrigerate any remaining dough in between batches). Enjoy immediately or store in an air-tight container for several days. These were one of my fave cookies eating as a kid! I love this! and love the Chinese New Year Cookie Party! We’re celebrating with friends on Saturday! 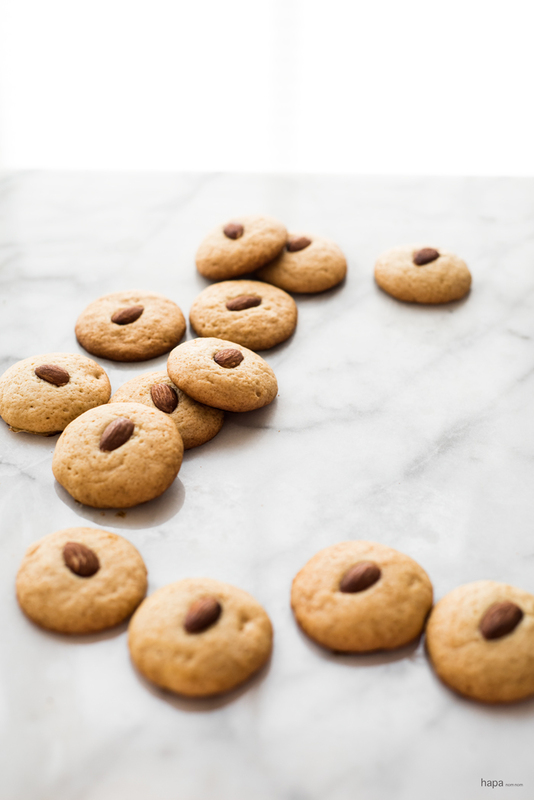 Honey and almond is such a lovely combination… These look like the PERFECT cookie to go with a good cup of tea. I’m such a big fan of all the things you create. These look so pretty and delicious! Love the combination! Pinning to try them, since I love cookies! Can’t wait to check the other recipes out! Thanks, Mira! I hope you enjoy them. Happy CNY! So sweet and pretty! Nothing like a good cookie to start the year off right! Delicious! Well who doesn’t love a cookie party!?!? What a line-up. 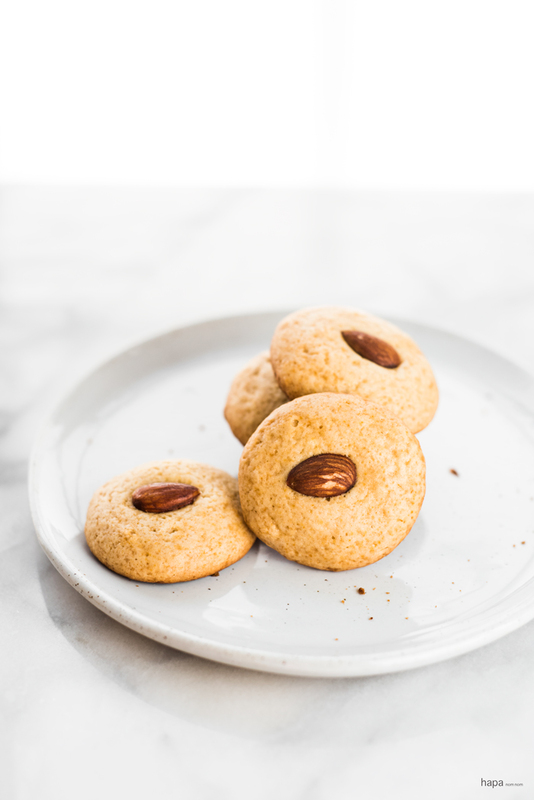 These almond cookies look fantastic and I love that they look elegant, but the recipe looks fairly simple. Oh boy, love anything almond and honey. These cookies looks fabulous! Incredible pretty, perfect for any tea party! Yes, the honey and almond definitely pairs nicely with a nice hot cup of tea! I always have a hard time choosing between the two “nuts” cookies between peanut and almond during CNY and ended up eating too much of both 😀 Love how your cookies turn out! Happy Chinese New year! These cookies look gorgeous! How fun! I do love cookies and there are so many delicious ones on this list! Happy Chinese New Year! Happy CNY to you too, Rachelle! Wow! These look amazing!! Never thought to add honey to this recipe. What a great idea! Can’t wait to try this out! Thanks so much! I had such a great time reading everyones awesome cookie recipes! Kathleen, these cookies look like the snacks that I just need. The honey sounds like a really great addiction. DELISH! Can we please make it the Chinese New year DAILY?! Because these cookies look beyond delicious, Kathleen!! LOVE the honey and almond combo going on here. I’m thinking these beauties are dangerous, because I want to eat a dozen at once! SO MUCH YUM! Cheers, my dear! The addition of almond on top of the cookies make them look so festive! Wish I can have a tub of these to munch on! Happy New Year, Kathleen! These Honey Almond Cookies are cute and delicious! I’m going to check out the others in this collection now! Happy New Year! You’re going to love the other cookie recipes – they all look incredible! I love baking with honey, it adds such a nice floral flavour. Wish I could eat them off my computer screen! Me too, Betty! Honey really does add such a wonderful flavor to baked goods! Kathleen, I will need one of your delicious cookies for each hand. They look so delicious and are a big hit at any party celebration. Happy New Year! These look like delicious cookies. Honey and almond are a delicious combination. Kathleen these look amazing! Sometimes a cookie with my morning coffee is just what I need haha – such a massive sweet tooth! Love how you have collaborated with other bloggers for the Chinese New Year, will have to check out everyone’s recipes 🙂 PS I am in love with the plate you put the cookies on – so beautiful! Thanks, Claudia! I actually had a few with my coffee this morning – so I hear ya on a little sweet goodness to start the day 🙂 Oh and I got the plate at Crate and Barrel – love their stuff! Oh…love..love almond cookies (or anything with nuts actually 🙂 ) These look incredible as usual Kathleen.